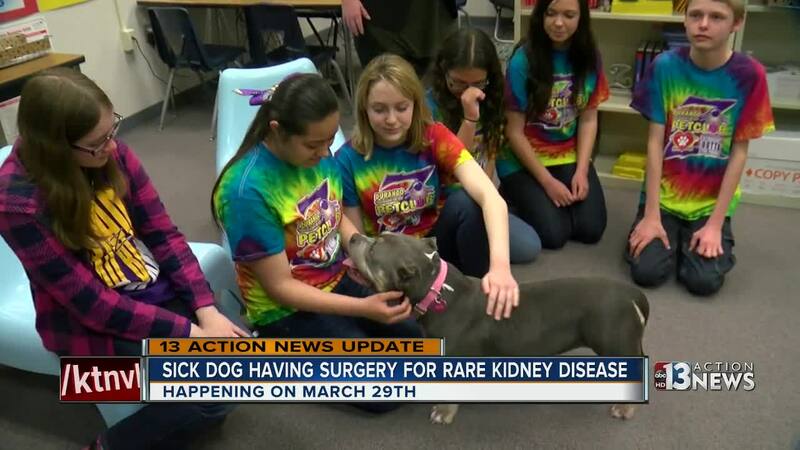 Lucy the dog will be able to have surgery to treat a rare kidney disease, thanks to donations. UPDATE MARCH 20: Lucy the dog will be able to have surgery to treat a rare kidney disease, thanks to donations. Students used crowdfunding to raise nearly $5,500 to pay for the surgery, which is set to happen March 29. LAS VEGAS (KTNV) -- A high school community is coming together to help a sick dog they've all grown attached to. As Lucy the pocket pit bull plays with the Pet Club at Durango High School, it's hard to tell how sick she is. "If she could talk she'd probably say, 'Hey, I'm in pain,'" said Candie Cuneo, the woman who adopted Lucy three weeks ago. The club is raising money to help pay for a $7,000 surgery Lucy needs. She has a rare kidney disease, but Cuneo wanted her anyway, rescuing her from a life on the streets. They've become fast friends. "Day one that they brought her over for a visit, she found a spot on the couch she claimed within 30 seconds so I guess it was just a done deal after that," Cuneo said. The Durango students also have quickly developed a connection with Lucy. "The thing that attracts me so much to her is she's such a lover," said Nick Smith, a member of the Pet Club. "I barely know her and she always jumps up on me and licks my face off." They all hope the surgery goes well next month because the plan is for Lucy to end up as a therapy dog after this. If you'd like to help pay for Lucy's medical bills, click here .